I've not been able to write as much as I would have liked to lately, with exploding computers, dying email and a sick wife. The most difficult part has been the sick wife. See the thing is that my lovely wife takes part in my whisky reviews, pointing out some hilarious observations about the different whiskies that I enjoy, observations such as "definitely baby diaper" off lovely Taiwanese sherry casks, etc. It always makes my night and since she's come down sick and unable to taste anything, my tasting has quickly dried up. However tonight she looked at me and informed me that I should crack a bottle. It's been too long, I know you miss it, it doesn't matter if I can't fully taste it. She informed me that she didn't want anything big and smoky so I looked into my Speyside section, and after eying a cask strength Benromach, Benromach Peat Smoke, Benromach 30 year old, amongst a heap of Grants, Glenfiddichs and Glenlivets I finally settled on Benromach Traditional. God only knows why, other then that I found the peat to be less intense then the other Benromachs and I just didn't feel like any of the other Speysides on hand. Plus I really wanted to play around with a Benromach. See Benromach tends to be a peated Speyside whisky, but nothing as intense as an Islay, so when I poured the whisky into it's glencairn the first thing to waft up was some gentle peat smoke. The second thing that strikes me is it's pale pale color. Almost clear. I'm stunned by the color so I immediately take to our good friend, the internet, to pull up some information about the casks used. In theory it's made up of entirely first fill casks, 80% bourbon, 20% sherry. Well I can tell what most of the cask influence is going to be by the color, but I'm a firm believer that it's not the color of the whisky, but the aromas and flavors that matter the most, and I love having a light naturally colored whisky vs a whisky full of caramel coloring. I hand the glass to my wife who wrinkles her nose and says that it smells like cigarettes to her. Hahaha I do believe that my choice for the evening was not the best one that I could have made. She then takes a sip, and while she says it's smokey, she doesn't mind it at all. Let's give this bad boy a shot shall we? The whisky is driven along by the spirit, not the casks, or so I believe, with peat being a standard characteristic. The nose has some soft peat, smoke, definitely some phenols so cigarettes is a pretty good description, some fruit, definitely citrus, lemons? small honey, and a small hint of vanilla hiding in the background. Not too shabby, but let's see how the palate holds up. Mildly floral, some peppery spiciness, heather, peat smoke, malted barley, mild vanilla. It's not incredibly complex, but mind you this is one of the entry level Benromachs, so I'm not expecting a heap of complexity anyway. It has a mild finish with the peat being the leading man. Not too shabby, a nice little whisky, which would run at around $70 or so AUS, which is reasonable for an entry level Speyside. If you're looking for a whisky that's not as intense as an Islay, but isn't the normal run of the mill Speyside, you could do a lot worse then Benromach Traditional. Not unlike the Springbank (along with Hazelburn and Longrow) CV's or even the Aberlour A'bunadh this is a whisky created to show what Benromach is all about, to display the character of this North-Eastern Speysider. It's good, nice and light, decent flavours, a good price ($70 AUD), what more do you need? Indeed... Not to be overlooked like many non-age-statement bottlings, I happen to know that the Benromach Traditional is typically a 7 Year Old, bourbon-aged whisky. The "hand selected (bourbon) oak casks" impart a good amount of subtle sweetness that I detect as a sort of light-licorice(twizzler, specifically)/vanilla on the nose. This is accompanied by a wonderful peating that, to me, is just below the line of peat & SMOKE. The palate lends itself to the bourbonesque flavors and has a nice maltiness to it. A touch of water brings a sharp sweetness to nearly take over the peat (it fights back after some time in the glass) with more of the bourbon & vanilla coming through on the nose -- Palate becomes more neutral, but slightly "golden" & perhaps more malty in character. Finish is short-medium and reminiscent of the entire experience. 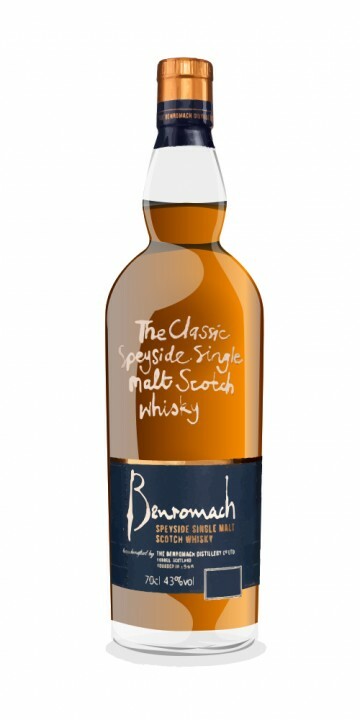 I think - for $29.99 retail in Upstate New York - that the Benromach Traditional is a very nice single malt, prompting my first review on connosr.com to give it the props it's due. Working in retail, I was privileged enough to taste both the Traditional and the Benromach 10 Year, which is an older version of the Traditional that sees some sherry before it hits the bottle. That slight bit of sherry aging brought a wonderful sweetness to the malt, but sort of stripped that fine line of peat that struck me so much in the Traditional. In short... For the price? Absolutely worth it. I had the chance to taste this single malt yesterday and a very fine one it is. Surely young, nevertheless already refined. That light smokiness really does the trick. Benromach Traditional smells like a doctor’s office. Very weak elements of peat and a vague sweetness mark the palate, but the alcohol is strong. The finish is so short and the whisky so forgettable that you are not quite sure that you actually drank it. At least five more years in a barrel would do this one some good. Skip it! I've seen comments elsewhere about the variable flavor and quality of this expression. The two bottles I've sampled in the past 4 months were very consistent, so maybe they've improved their quality control. Still, the flavor is quite simple; it makes me think of a lighter Irish whiskey with a moderate amount of peat smoke. I don't know if they have changed the whisky in the bottle, but I recently gave this another try and really liked it.